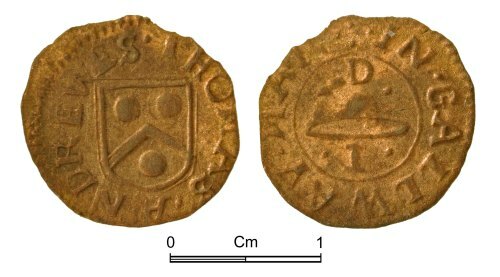 A Post Medieval copper-alloy trader's token issued by Thomas Mathewes at The Bear in Burford, c1650-1670. BW Oxford no 48. A Post Medieval copper-alloy trader's token issued by Richard Haines in Watlington, c1650-1670. BW Oxon no. 217. A Post Medieval copper-alloy trader's token issed by Rob Alchorne, Eaton Bridge (Edenbridge), Kent, c1650-1670. BW Kent 245.